Is a high performance ground block featuring a zinc body with machined threads and multiple ground screw configurations. 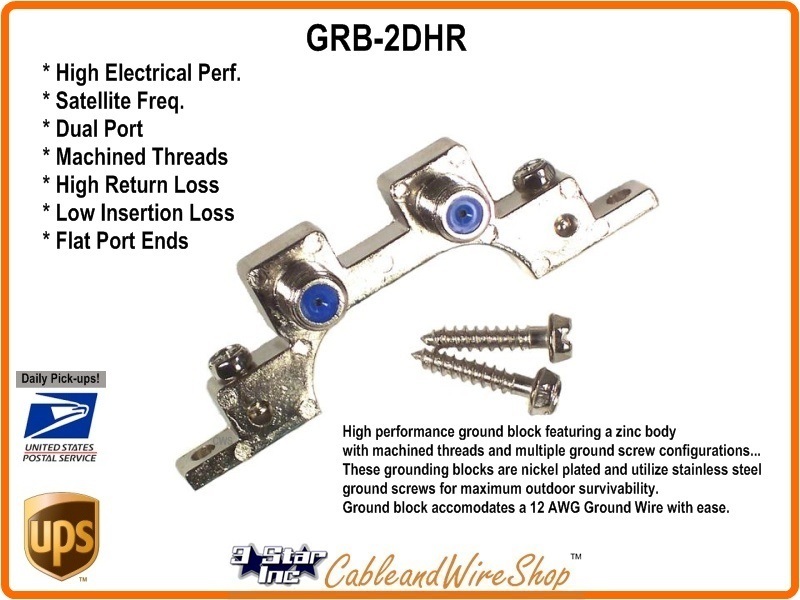 These grounding blocks are nickel plated and utilize stainless steel ground screws for maximum outdoor survivability. Ground block accomodates a 12 AWG Ground Wire with ease. Note: This is what you want to use to Ground your Satellite, Cable TV or HDTV Antenna Coaxial Cable Outside before bringing the Signal Inside. This way, Lightning Strikes and Power Surges have an opportunity to arrest before reaching your TV and Entertainment Electronics. The grounding Block will convey this unwanted Electrical Energy to a Ground Rod via a Copper Ground Wire that you Install (not included). This Item Features a Hi Pressure Center Conductor Seizing Mechanism that Assures a Maintenance Free Connection for Longevity. Consult your Local Building Code and NEC for guidance to Properly Grounding your HD TV Antenna, Cable TV, WI-FI, Wireless Internet, Business Band, CB or Amateur Radio Antenna Installation.